Spectacularly bad. Magnificently god-awful. 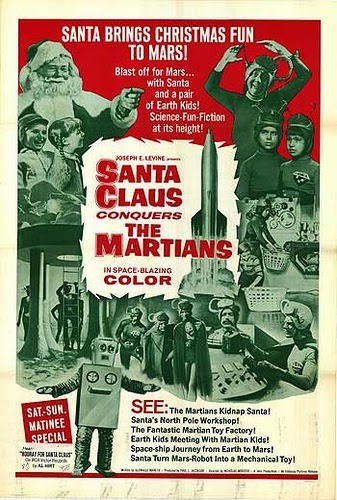 That pretty much describes Santa Claus Conquers the Martians which has been given a spot on the 100 worst films of all time. Here’s the thing: First of all, this film was made for children, so let’s cut it some slack. SCCM is a delicious slice of 1960’s children’s TV fair that has the sentimentality of Lassie and the humor of Dennis the Menace. Scarface it is not! Secondly, this film was made for a paltry $200,000 and includes scenes from the North Pole, outer space and the planet Mars. It also has a sizable cast including Pia Zadora in her first film! You gotta give them an A for effort! Yes, the costumes are horrible and amateurish. Yes, the script and acting are just as bad. Yes, the sets look like they were made for a Jr High School play. But, who cares? Like Ed Wood’s Plan 9 From Outer Space (1959), SCCM is exuberant, independent filmmaking that knows exactly what it is and celebrates it with gusto. This is one of those films that falls into the “so-bad-it’s good” category. If that’s your kind of thing [and it’s my kind of thing] then don’t miss this one. SCCM may be best viewed in December with a group of friends, Christmas cookies and spiked eggnog. It will definitely be a part of my holiday celebration from tis time forth and forevermore!